The photographs of Jana Müller & Wiebke Elzel, Sebastian Stumpf, and Rebecca Wilton lead the viewer on a search for hints and clues. 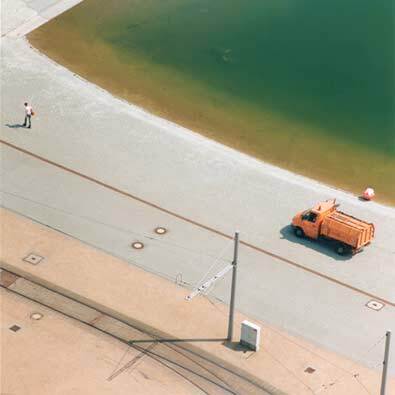 In the joint works of Jana Müller & Wiebke Elzel the lack of evidence makes it difficult for the viewer to clearly understand what has just taken place in the photographed space devoid of people. There is no trace of the inhabitants or users, and their disappearance remains unsettling. The story remains a mystery. In contrast, Sebastian Stumpf plays with model-like aspects of real scenes and blurs the boundary between the two, so that viewers are perplexed and lose their orientation. His work "plan", which consists of 12 square photographs, is an urban area with a lake, greenery and streets that is photographed from above. Recalling the squares of a city map, it will not help you find your way. Instead, the images raise the question to what extent the artificial environment corresponds to the construction plan and how well it can be navigated by people who seem to be model figures. Also in Rebecca Wilton´s photographs the figure, usually the artist herself, is depicted on a small scale in public or semi-public places. Forgotten, abandoned spaces sought out only by the depicted individual but still bearing witness to past human activity is a central theme in the artist's work. The woman in the photograph has apparently lasted beyond the passage of time and forgetting. Now she stands in a bathing suit on the diving board of a dried up swimming pool or sits in a sports outfit on the bench of an empty gymnasium. Clothed appropriately for her surroundings, she appears to be just as forsaken and alone as the abandoned site. Like a living relict from another time, she adapts to the scenery like a chameleon—without being consciously aware that all her attempts to use the space are in vain.